Aaron Lennon celebrates with Burnley goalscorer Johann Berg Gudmundsson following the winger's equaliser against Manchester City at Turf Moor. 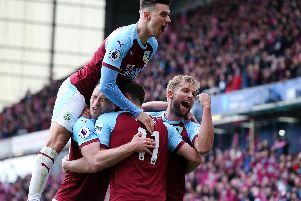 Research conducted by BetStars has found the top points earners in the Premier League this season, with Johann Berg Gudmundsson earning eight points for the Clarets this season, more than any other player at the club. Of Gudmundsson’s seven combined goals and assists contributed this season, three have been match-winning and two have secured draws for the Clarets, earning them eight points. Without Gudmundsson’s contribution Sean Dyche’s side would currently be in the midst of a relegation battle in 14th place, only two points above the relegation zone. Manchester City’s Kevin De Bruyne leads the way as the number one ranked player in the Premier League. Of the seven goals and 14 assists the Belgian midfielder has contributed this season, 10 of these have been match-winning for Pep Guardiola’s side, earning the Citizens a whopping 20 points, without which they would not even be in the top four. City would actually sit in fourth place on 52 points, behind rivals Manchester United as well as Liverpool and Chelsea. Following in De Bruyne’s wake is in the in-form Harry Kane who has earned Spurs 17 points this season having scored or assisted seven winning goals this season and three equalising goals to keep Tottenham in the hunt for a top-four spot. Without Kane’s 17 points this season, Mauricio Pochettino’s men would currently sit 7th in the table. In third spot is Chelsea’s Alvaro Morata, who despite receiving a lot of criticism recently has scored or assisted eight winners for the Blues this season, contributing 16 points to their league tally. Antonio Conte’s side currently occupy fourth place in the Premier League table, but without Morata’s contributions this season it could be a very different story, with Chelsea sitting in 6th spot, behind London rivals Arsenal.